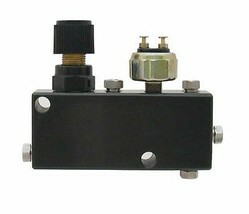 Adjustable proportioning valve and distribution block all in one. Features a rotary adjustment to regulate rear brake pressure and help maintain correct brake bias between front and rear. Distribution block connects to master cylinder and distributes brake fluid to all four wheels. 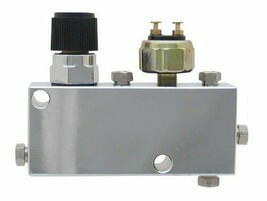 Includes five stainless steel fittings for 3/16" brake line, brake light switch and wiring pigtail. Black.